When veteran actor Lim Kay Tong was chosen to play Singapore’s founding Prime Minister, many agreed there could have been no better English-speaking local actor to take on the role. Furthermore, it was hard to ignore Kay Tong’s screen presence and impressive screen credentials, which included Hollywood experience acting across celebrities like Sean Penn. From the moment 1965 was announced, there was a palpable buzz surrounding the film about Singapore which was launched at the end of July, just before the country’s 50th National Day. A great deal of the excitement revolved around who would be cast as the late Lee Kuan Yew, whose character in the film frames the timeline of the story. When veteran actor Lim Kay Tong was chosen to play Singapore’s founding Prime Minister, many agreed there could have been no better English-speaking local actor to take on the role. Furthermore, it was hard to ignore Kay Tong’s screen presence and impressive screen credentials, which included Hollywood experience acting across celebrities like Sean Penn. A less experienced actor would have buckled under the pressure of not only playing one of the century’s most formidable leaders who was still alive while the filming work was ongoing, but also doing so to an audience primarily made up of countrymen (and indeed, since the film’s release, there’s been an outpouring of comments about the script, actors and so on). But not Kay Tong. 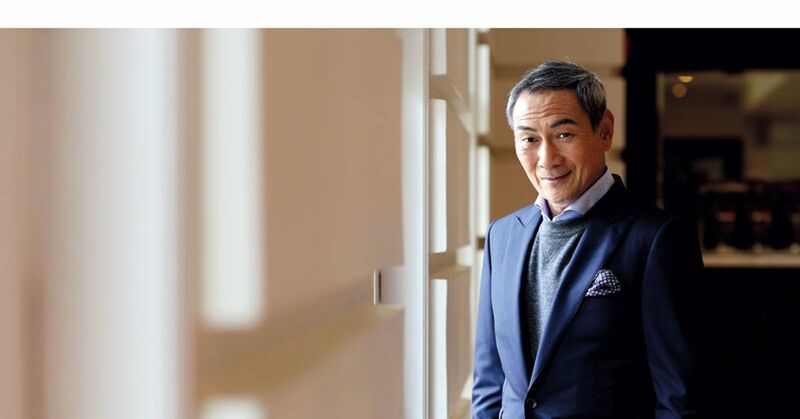 In an interview with Melissa Gail Sing, Singapore’s favourite thespian talks about the opinion that matters most to him and the effect playing a nation’s hero has had on him. What were your earliest impressions of Lee Kuan Yew? The press conference announcing separation. I was in a state of shock. Here was this tough, no-nonsense leader who broke down. It was sobering because, even as a pre-teen, I sensed the seriousness of Singapore's predicament. Did you ever meet him personally or have any real-life encounters with him? When he died in March this year, he was given a hero’s farewell. In what way was he your hero? As with most Singaporeans, many facets of my life are a result of his ideas and policies. The academic and employment requirements of developing Singapore did not include my strengths which were literature, geography and history. I was very lucky that my parents could afford to send me abroad for studies at the age of 10. The system in the UK focused on my strong points and also placed importance on sports, which I was good at. Then there was National Service. If not for that, I would probably have remained in the UK. As it was, my life took a different trajectory. Ironically, if it weren't for NS, I might not have become an actor. It was during that time that, in search of an outlet from military service and playing rugby for Singapore, I stumbled upon acting and found my calling. Strange isn't it? So I opted to study drama and literature at university, and then went to drama school in London to train as an actor. Later, on my return to Singapore, I joined the press, because there were no jobs for actors working in English. I got to cover the Anson by-election and saw the repercussions for the press after the results. It was the pressure on the media that partly influenced my decision to pursue my vocation and passion—acting. As a result, I started TheatreWorks and struck out as a full-time professional actor. So, Lee Kuan Yew’s policies pushed my life in certain directions. Unpredictable and rewarding. Did you ever think or hope you’d one day play the role of LKY? Why did you agree to take on the role of LKY in the movie 1965? It was a challenge. But on mulling over it, I reasoned that this role might never come my way again. Apart from the role, the script must have appealed to you as well? Yes, it did. It was well told. There were many strands to it, with about half a dozen characters, and it basically follows those half-dozen fictitious characters. LKY is the only kind of real-life character, so to speak, and he, defines the timeline of the story. So, it’s not really about him and everything that I did, with the exception of maybe one little part, everything is on record, whether on film or radio broadcast, etc. So nothing was made up and I felt safe because of that, because it was taken from record. If there was any fictitious element to it, I think I would have had some reservations because we only know the public man. So I felt safe because of the parameters within which they kept the character of LKY in the story. Were there any characters or themes in the story that you related to on a personal level? I could relate to it on many levels because the film is about multi-racialism. That’s what it’s about and it’s seen through the lens of the riots. We had two riots in 1964 so that resonated with me, because that was the whole reason for Singapore’s being. The reason why we split from Malaysia was because Malaysia wanted a Malay Malaysia not a multi-racial Malaysia. That was the huge difference and that was, in our history, a defining moment. And I think it’s an example to many countries around the world that have people of diverse backgrounds. So that struck a very strong chord with me. What was your biggest fear about taking on the role? What were some of the unusual things you did to prepare for this role? Discovering the man behind the autobiographies, the news footage, the radio broadcasts, rally coverage and the press conferences. But it turned out they all revealed him as he was. He was an open book. Every role requires preparation. I don't think I approached the role of LKY very differently. You just have to find out as much as you can about your character and that's what I did. What was the most difficult part about playing the role of LKY? Trying to get the right vocal register and speech rhythms, which are very distinct. Ultimately, I ended up interpreting these aspects rather than impersonating them. Were there any similarities you observed between LKY and yourself? No, no, no… (laughs). He’s far more capable than I’ll ever be on all levels. There is only one thing I found we have in common. I used to jog and he was very keen on running in the later stage of his life. So, maybe I am that same creature in terms of staying fit, but I think that’s the only similarity between us. As for the power of his intellect and personality and the power of his will, I can’t say I can match that. I do have a strong will about certain things that I care about but it’s totally different. He had such a will for Singapore, which was a massive undertaking and I just occupy a little corner of the work I do. How did you react knowing that the man you portrayed had passed away? I finished my work on LKY in November 2014, so he was still alive then. This means I was conscious of portraying a living legend. Now that he has passed on, I feel enormously privileged to have portrayed him. How did your perception of the man change after playing this role? I now have abiding respect and admiration for him. Without his fire, passion and diligence and his leadership of the Second World War generation, Singapore wouldn't be where it is. I didn't always feel this way however. There were policies or ideas I disagreed with, but this is small beer compared with what he made of Singapore. He was an outstanding leader by any standards. What’s the biggest lesson you’ve taken away from this film experience? Never say no until you weigh things up. It could be one of the most enduring moments in your career. Did playing Singapore’s founding prime minister to an audience that’s primarily made up of your countrymen make this your most difficult role yet? The most important opinion is my own, because it is about whether I can accept what I see of the finished product. Whatever I do right or wrong can then be stored away for reference when tackling another role in the future. That scene of LKY’s speech on the separation was a defining moment in the nation’s history. What’s the most defining moment in your career? And in your life? My defining moment was when I decided to become an actor—I think that if I had taken another path, I wouldn’t be a very happy person. My dad had wanted me to become a lawyer so when I applied to a university in the UK, he had underlined a lot of the law courses but I, without telling him, applied to study Drama. There were about five universities offering it at that time and I got into one. When I told him that I got accepted, he said, “That’s fine. It’s good to pursue what you love but don’t ever be bitter or disappointed with your decision.” That’s the only advice he gave me. So yes, it changed my life because I had his endorsement and I think that subconsciously you then want to prove yourself. So that was definitely a defining moment. The stakes were very high because nobody had done it but I was pretty sure about it, and from then, there was no turning back. A defining moment in my personal life? Marrying my wife Sylvia Tan. They always say that behind every bloke there is a woman, right? And I think it’s true, if a bit cliché. I was a journalist at the time and getting increasingly frustrated, and she was the one who actually said, “Look, just go out and do it; I’ll support you”, which she did for a number of years until my career took off. Without that kind of support, maybe I’d be doing something else or maybe I’d still be a journalist. If I had married someone else, that may not have been the case. Another woman might have said, “Just get out there and get a proper job”. She was the one who propelled me forward to become a full-time professional actor. What kind of film and theatre scripts interest you, and what are your favourite kinds of characters to play? For me, scripts have to be well written, which for me means that the characters are three-dimensional. My favorite characters are Harry Lee in Perth, Johan Tan in The Photograph, Charlie Tay in Growing Up and I hope Lee Kuan Yew in 1965.
Who do you hope to play next? I am hoping to meet him in the near future. It's all about chance. What are the high points in your career? Growing Up, Perth, The Photograph and again, I hope, 1965. Getting only one job in 1991. What drives you or brings you greatest fulfillment? Being an actor and continuing to work as one in quality projects. You're only as good as your last job. And if you were, than can you make it even better in the next one? What are your lesser-known interests outside of acting? Being a sports fan, I watch sports. Rugby was my game. I played for Singapore and I was the captain of my school team. I follow that with passion. I also read when I find time, but my main hobby now is my granddaughter, who’s 22 months old. Sylvia and I look after her three to four times a week and it’s almost a full-time job. And because my wife writes about food, we do eat out at least once a day and we try new places you read and hear about. We follow several local chefs and whenever we travel, I’ll usually do the research and look for restaurants to try. So, looking for the next interesting meal is a pursuit. I don’t cook, I’m absolutely hopeless at it because my wife does all the cooking at home. She’s written nine cookbooks so she’s always trying a new dish and we eat in at least once a day. My buddies and I also enjoy sharing a good drink. We drink wine, whisky and sake and I like pairing wine with food. What are you busy with currently? On July 3rd, I did a one-night performance with the Singapore Chinese Orchestra where I read quotes from Lee Kuan Yew that had been paired with a piece of music. There’s also a telemovie on Okto I’ll be appearing in on August 15th. It’s called Second Chances and is about a group of old folks who break out of an old folks’ home to go to one of the residents’ daughter’s wedding in Malaysia.